Last time we learned that electric utility power plants must have water treatment systems in place to remove contaminants from incoming feed water before it can be used. This clarified water is then fed to a boiler by the boiler feed pump as shown below. As it stands this setup will work to provide electricity, however in this state it’s both inefficient and wasteful. We’ll see why in a minute. Boilers, as their name implies, do a great job of heating water to boiling point to produce steam. They do this by adding the heat energy produced by burning fuel, such as coal, to water, then steam. 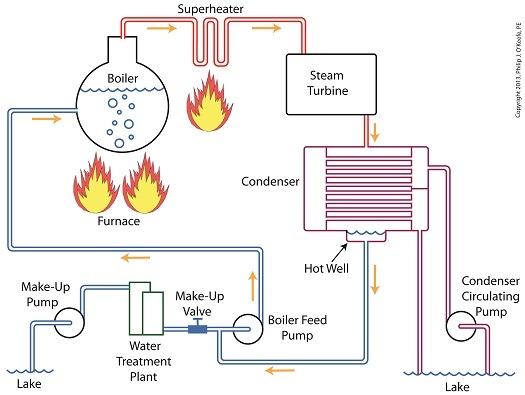 We learned in earlier blogs in this series that the energy used to heat water to boiling point temperature is known as sensible heat, whereas the heat energy used to produce steam is known as latent heat. The key distinction between these two phases is that during sensible heating there is a rise in temperature, during latent heating there is not. For a review on this, see this blog article. When water starts to heat inside the boiler, sensible heat energy is said to be added. This is represented by phase A of the graph below. During A, heat energy will raise the temperature of the water to boiling point. As the water continues to boil in phase B, water is transforming into steam. During this phase latent heat energy is said to be added, and the temperature will remain at boiling point. In phase C something new takes place. The temperature rises beyond boiling point and only steam is present. This is known as superheated steam. For example, if the boiler pressure is at 1,500 pounds per square inch, steam becomes superheated at temperatures greater than 600°F. 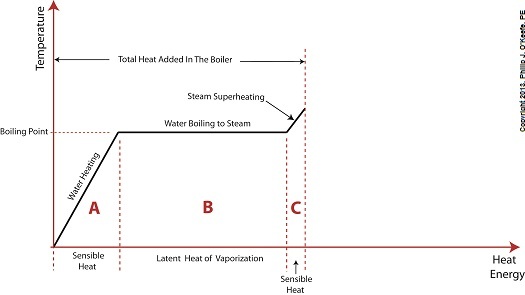 Unfortunately, boilers alone do a poor job of superheating steam, that is, continuing to raise the temperature of the steam present in phase C. This is evident by the fact that phase C is quite small in comparison to phases A and B before it. This inefficiency in producing ample amounts of superheated steam results in a small amount of useful energy being provided to the turbine down the line, which is bad, because steam turbines require exclusively superheated steam to run the generator. 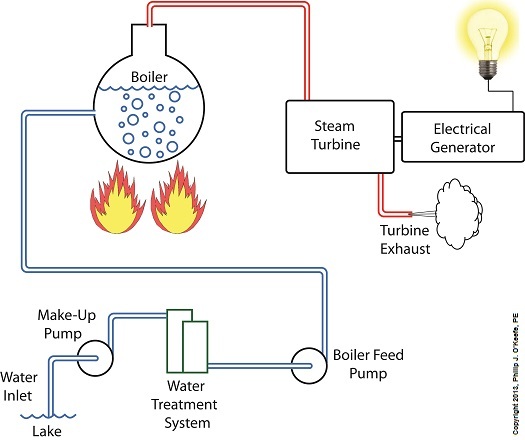 Next time we’ll see how to provide our steam turbine with more of what it needs to run the generator, more superheated steam.